The metallic canvas is often overlooked. There is a little bit of give and take with it since the canvas texture does hinder it just a little. Still, it is not a bad choice. Easy to order, does not need to be framed to be hung and a great choice for larger prints. The standard metallic fine art paper is nice choice. Branded as Moab Slickrock Metallic Pearl, it has a smooth surface, light silver color base with a high gloss to make images really stand out. What is favored with this fine art paper is the ability to take advantage of the superior color accuracy this giclee photo quality has the ability to provide. Treat these prints with utmost care when handling until they are framed. Once they are framed they will last for generations due to their archival nature. Next is the Kodak Endura Metallic. Not as heavy weight as the Slickrock, it is a good secondary choice where cost is more of an issue. Compared to the Slickrock, the gloss level is a bit higher, almost providing a wet look. The printing technology used to produce these prints is also exceptional but does not use inks. To some used to the heavier weight of the Slickrock, they may look a little cheap but they are more scratch resistant since the image sublimates from the paper utilizing a combination of chemicals and light. Then of course there is an actual metal print on aluminum panels in which the image is provided by dyes that fuse to the surface. You can go with a metal that has a white gloss base but for a truly metallic look, you might want to opt for the silver finish. While we make a lot of prints on the silver matte, the silver gloss is our recommended choice since you get a high shine with the metal look. No matter the type of metal base, there is no mistaking your are printing on metal whereas with canvas or any of the papers, you are merely simulating the effect of metal. Finally lets talk about the Hahnemühle PhotoRag® Metallic as previously mentioned. We recently provided a preview of a new paper which we think will help to provide some of that shimmer and gleam people are after when it comes to a metallic print. With it, the fine art industry will see a new paper that elevates giclee and photo printing to a new level. As the inventor and pioneer of genuine artistic papers, Hahnemühle fulfills the wish of many photographers by offering a paper made of 100% cotton with a metallic effect. 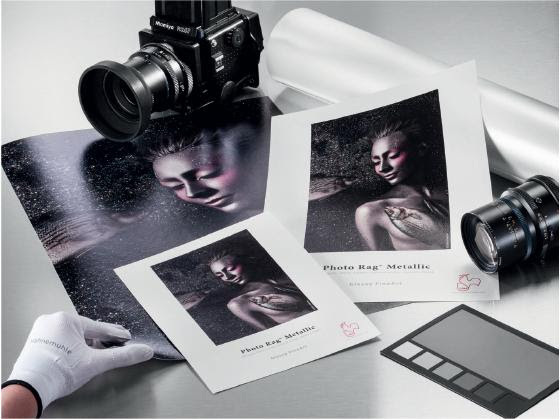 The evenly shimmering metallic look corresponds perfectly to the family of a real artists’ paper from the benchmarking Photo Rag®-family but also makes PhotoRag® Metallic a unique paper in the fine art printing industry and you can be one of the firsts to have images printed on this paper! Do All Images Look Good as a Metallic Print? Not all images are going to be ideal and benefit. The key to taking advantage of a metallic surface lies with how detailed the image is and how much of a range in tones the image contains. Commonly, an image with a lot of detail and a lot of tones will look best. Also, the image MUST be sharp and clear. An image that is too pixelated, or too soft might in focus be better served as a regular canvas print or on a matte paper like the regular Hahnemühle PhotoRag® 308 which we offer at FinerWorks. In any metallic print, be careful of using images which are too dark. Because detailed images usually look best, if it is too dark may you might loose the advantage a metallic surface offers. Remember even if there is a lot of detail you see on your screen in a dark image, unless you soft proof first, there is the potential for the for those details in the darker areas to be lost or less visible when printed. How you display a print which is metallic plays a big role in its appearance. If you get your new print, take it out of the packaging but are in a low lit room you might be underwhelmed. You think “okay I have a nice looking print” but feel it lacks that “Wow!” factor. It’s once you take it into a room or even outside where the light is greater you will notice a difference. So, based on that, I recommend you display metallic prints where you have good lighting. And if you plan to frame a paper print, it might be wise to forgo any glazing or glass since that has the potential to cover us the vibrancy the print provides. If you do choose glazing, be aware a reflection control glazing might darken the image a little but you will not have to worry about the glare of the glass overpowering the metallic look. With metal prints and even the metallic canvas, you don’t have to worry about framing and placing behind glass. Those are meant to be hung with the printed surface fully exposed. Ultimately it is your choice as to what will best serve its purpose if a metallic look is what you are after. You can always try different options to see what you will like, but don’t forget to be aware that just because one image does not work well, another image might look much better.